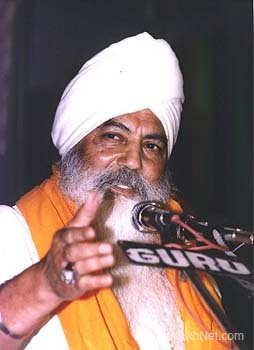 Here is another lecture by Siri Singh Sahib Harbhajan Singh Khalsa Yogi Ji in Punjabi. I am unsure of the date/location of this, but think it was from the UK in the 90’s. This one is much longer (85 minutes) than the last one I posted and the audio quality is variable so you’ll have to be patient and listen carefully. This audio is from malasia 1977 ( Singh sahib himself says in the audio ).Very powerful audio ; should be played eveywhere in india .Although a sikh should not need any logical/yogic/scientific explainations for sikhi . But still yogi ji’s words are very useful for the present generation (my generation ) who have a lot of inclination to show off that we are very modern and rational and hence have done away with our sikhi swaroop which ( according to our skewed thinking ) is outdated. Anon: If you are on windows…double click on the little speaker icon in your lower right hand area next to your clock. Then.. raise the volume on “WAV” and “Volume”…and make sure your speakers are turned up. SSA, I had it on max, the speakers , but still the volume was minimum.I had to put my ear to my laptop. Sat Sri Akaal everyone, With Guru’s blessing i was able to listen to it perfectly fine. thanks have a nice day. Puja. SSA Veerji: This is the best speech I have ever heard and is based on the realty that is happening now at present. I would highly recommend everyone hear this carefully. Could also post somein punjabi. 112403293890917323 - Here is Narayan and Arjan after we hiked back down the mountain from the natural hot springs. Narayan brought his new "playmobil" helecopter.